U.S. and coalition military forces — including Marine pilots from Miramar — struck 34 ISIS targets in Syria and Iraq on Saturday. 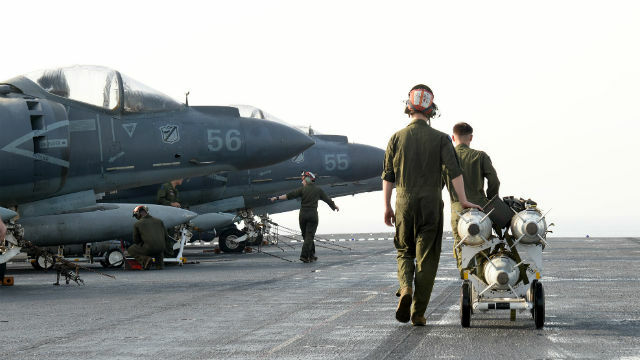 Navy planes from the USS Harry S. Truman in the Mediterranean Sea, Marine Harrier jets from the USS Boxer in the Arabian Sea as well as Air Force bombers and remotely-piloted drones are attacking the Islamic State. The Harriers are assigned to Miramar-based Marine Medium Tiltrotor Squadron 166, the aviation combat element of the 13th Marine Expeditionary Unit, embarked with the Boxer Amphibious Ready Group. The Harriers began boming ISIS targets last Thursday. The Pentagon reported details of 16 air strikes in Syria and 18 in Iraq. Near Abu Kamal, a strike destroyed three ISIS oil well heads. Near Raqqah, three strikes struck two ISIS-used bridges and an ISIS staging area. Near Ayn Isa, a strike destroyed two ISIS rocket systems. Near Dayr Az Zawr, a strike struck an ISIS tactical unit. Near Manbij, nine strikes struck nine separate ISIS tactical units and destroyed 11 ISIS fighting positions and an ISIS vehicle. Near Mara, a strike destroyed an ISIS vehicle and an ISIS heavy machine gun. Near Baghdadi, two strikes struck an ISIS beddown facility and an ISIS staging area and destroyed an ISIS bunker. Near Beiji, two strikes struck two separate ISIS tactical units and destroyed an ISIS fighting position, three ISIS vehicles, an ISIS heavy machine gun, an ISIS recoilless rifle and an ISIS mortar system. Near Fallujah, four strikes struck three separate ISIS tactical units and destroyed 22 ISIS fighting positions, two ISIS vehicles, 10 ISIS heavy machine guns, seven ISIS light machine guns, an ISIS recoilless rifle, three ISIS rocket-propelled-grenade systems and an ISIS vehicle-borne bomb and denied ISIS access to terrain. Near Kisik, a strike struck an ISIS tactical unit and an ISIS assembly area. Near Mosul, a strike struck an ISIS oil headquarters. Near Qayyarah, five strikes struck an ISIS tactical unit and destroyed three ISIS mortar systems, an ISIS assembly area, an ISIS weapons cache and an ISIS command-and-control node and denied ISIS access to terrain. Near Ramadi, two strikes struck two separate ISIS tactical units and destroyed an ISIS fighting position, an ISIS vehicle, an ISIS vehicle-borne bomb, an ISIS boat and an ISIS light machine gun and damaged a separate ISIS boat. Near Tal Afar, a strike struck two separate ISIS foreign fighter command posts. The Pentagon defines a strike as “one or more kinetic events that occur in roughly the same geographic location to produce a single, sometimes cumulative, effect.” That means a single strike can range from one aircraft delivering a single weapon against a lone ISIS vehicle to multiple aircraft delivering dozens of weapons against buildings, vehicles and weapon systems in a compound. Joining the United States in Operation Inherent Resolve are aircraft from the United Kingdom, Australia, Belgium, Canada, Denmark, France, Jordan, the Netherlands, Saudi Arabia, Turkey and the United Arab Emirates.